Academic Calender (First Term) 2017-18 . 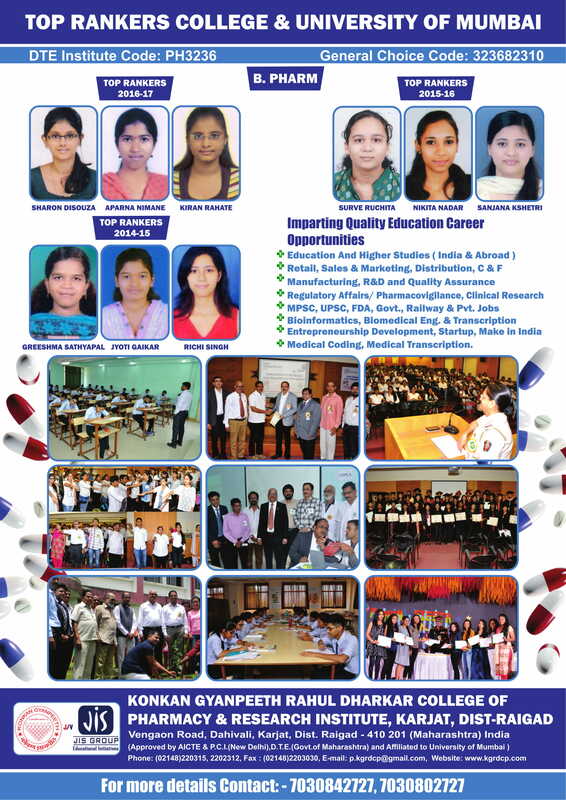 The B.Pharm course of the University of Mumbai follows a semester pattern. The Course comprises of 8 semesters (4 yr). In each semester students have to attend theory classes & practicals prescribed as per the B.Pharm syllabus of the University of Mumbai. During each semester students have to appear for a periodic examination and a semester examination. Degree will be awarded for those passing in all the 8 semesters as per rules & regulation of University of Mumbai. In this course, the subjects offered are Anatomy, Physiology & Pathophysiology, General Chemistry, Organic Chemistry, Physical Pharmacy, Pharmaceutics, Pharmaceutical Engineering, Pharmaceutical Analysis, Microbiology, Biochemistry, Pharmacology, Pharmaceutical Chemistry, Pharmacognosy, Hospital Pharmacy and Drug Store Management, Cosmeticology, Biopharmaceutics and Pharmacokinetics, Pharmaceutical technology, Forensic Pharmacy. i) The candidate should be an Indian National. (ii) Passed HSC or its equivalent examination with Physics and Chemistry as compulsory subjects along with one of the Mathematics or Biology and obtained at least 50% (at least 45% marks in case of candidates of Backward class categories and Persons with Disability belonging only to Maharashtra State) in the above subjects taken together. (iii) Should have appeared in all the subject and should obtain non zero score in CET conducted by the Competent Authority. 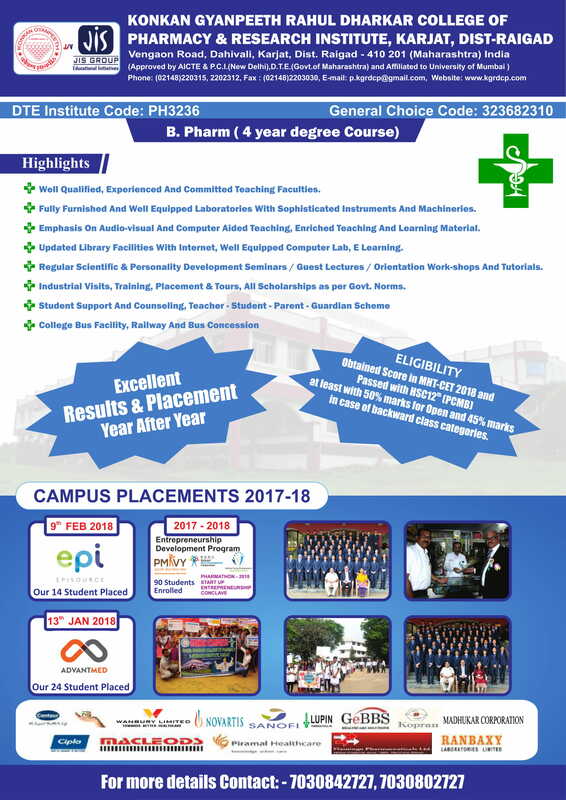 (ii)Passed Diploma Course in Pharmacy with at least 45% marks (at least 40% marks in case of candidates of Backward class categories and Persons with disability belonging to Maharashtra State only) from an All India Council for Technical Education or Pharmacy Council of India or Central or State Government approved Institution or its equivalent. Candidate should pay the fee through demand draft of any nationalized bank in the name of The Principal, Konkan Gyanpeeth Rahul Dharkar College of Pharmacy, Karjat Payable at Mumbai. 9. Migration Certificate If Candidate is passed (Std. XII/ B. Pharm) Exam, other than Maharashtra State Board/University. 10. Educational Gap Affidavit If Candidate is passed Std. XII / Diploma/B. Pharm Exam. Note: – Candidates should keep a Xerox Set of the above documents for their personal record.